180 pages | 18 B/W Illus. Technology offsets, a nonconventional international trade-financing tool, is used by governments (buyers) to obtain industrial and technological benefits from companies (sellers) as part of international procurement. Offsets deals involve billions of dollars and this practice exists in around 80 countries around the world. Though offsets is a popular practice in defence, it is increasingly gaining popularity in civil sectors. Offsets is often tainted by controversy and receives bad press. What then makes offsets popular? Governments claim that offsets delivers technology and knowledge transfer, skills in high technology sectors and employment, and offsets expands export opportunities through participation in OEM supply chains. For companies, offsets is mainly employed as a tool to obtain a competitive edge and win sales in international business. In the past, there have been mixed results of case studies on the impact of offsets successes and failures. Considering the mismanagement of globalisation, unfair trade agreements and current political and economic discontent, there is a stronger need for governments and companies to use vehicles such as offsets to create a relationship of trust and commitment for sustainable development. This book fills the gap in offsets and focuses on how to manage offsets more effectively by addressing issues of strategy, policy and implementation, technology management, governance and risk. 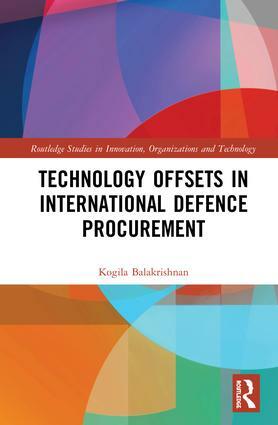 Technology Offsets in International Defence Procurement is designed for those studying international procurement, international trade, international business, technology management, defence policy and industrial policy. This book will also be of interest to practitioners and policy makers in both government and industry. Kogila Balakrishnan is currently the Director for Client and Business Development (East Asia) at WMG, University of Warwick. She began her career in the Malaysian civil service where she was instrumental in the development of national offsets policy and subsequently retired as the Under Secretary for Defence Industry in 2016. Kogila holds an BA (Hons) from University of Malaya, LLB (Hons) degree from the University of London and an MA in Strategy and Diplomacy from the Malaysian National University. She won a Fulbright Scholarship in 2003 and held a Chevening Scholarship during 2004–2007, when she obtained her PhD in offsets and technology policy from the Defence College of Management and Technology, Cranfield University, UK Defence Academy. She presently holds an Adjunct Professorship at the Malaysian National Defence University and continues to advise governments and organisations on offsets policy. Kogila is married and has three wonderful children.